When you travel to Costa Rica’s Central Valley, you can be part of an ancient mystery. Guayabo National Monument is an archeological marvel that was discovered when the area was being cleared for coffee plantations in the late 1800’s. At its peak, around 10.000 people used to live in this ancient city. It is believed that the first settlers came to these parts around 1000 BC and had created a bustling city by 800 AD. As to why they disappeared, it is still not known. The only remains of this once great city are circular mounds, cobblestoned pavements and evidence of highly refined aqueducts. These are only a few pieces of the puzzle, but they seem to point to a civilization that had reached some level of sophistication as city builders So, what made 10.000 people just disappear even before the Spanish settlers first came to shore? The short answer is, no one knows. There are a handful of theories including the plague or even volcanic activity. Today all that remains is an archaeological site that both intrigues and inspires. When you arrive at the ranger station, you will be met by the park ranger who takes great pride out of protecting this historical site. Unlike sone other sites in Costa Rica, here the tourists only pay 5 USD for the entrance ticket. You will soon notice that the Monumento Nacional Guayabo is a lot more than just archaeological hints of a once great civilization. There are also great discoveries to be made in the details. The tombs and petroglyphs were excavated by archaeologists in 1963 and show small insights into their rites and beliefs in both political and religious contexts. There are sculptures and artifacts with crude but beautiful animal carvings like Jaguar and alligators. Certain parts of the excavations can also be admired in the National Museum in San Jose. The rain forest areas surrounding the ancient ruins are lush and fertile. There is an abundance of fauna and flora and if you are lucky, you might be able to spot some wildlife like coatis, toucans and armadillos amongst the dense foliage. If you lucky, you might even spot a sloth! Make sure you explore the monument with one of the guided tours so you can get the most out of your visit. You can also do the hike alone but you will only be provided with the basic information on the panels at every view and resting point. The hike is 1.6 kilometers long and relatively easy. There are a couple of smaller hills to climb along the way and there is a special trail that is wheelchair accessible. You will take a hike along the rocks engraved with animals and grave sites, and head up to the mirador where you can get a good view of the whole archeaelogical site. After that, you can roam the lower regions of the site where you can get a closer look at the ancient source that is still providing water and the mounds that formed the base for the huts. You will see circular mounds in different sizes – the biggest one belonging to the chief – and also 8-shaped and square foundations. 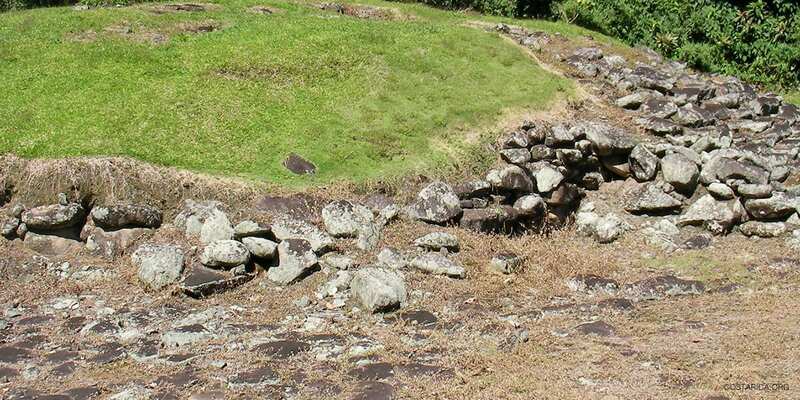 The 8-shaped mounds are unique to Guayabo and show a culture that is highly refined and experimental in its city building. The central market is lodged in the middle of a long, central lane leading up to the chief’s residence. Take advantage of the educational opportunities and also visit other nearby sites like the Guayabo butterfly farm. When you are in the area, you should definitely pay a visit to Irazu, otherwise known as El Coloso. You can explore the trails and view the 4 craters at top including the gorgeous, green main crater and the Diego de la Hoya crater, named after the man who registered the volcano’s first eruption in 1723. This national park is close to the city of Cartago and very easy to reach from San Jose. On the way down, make sure to stop off at the Duran Sanatorium and explore Costa Rica’s most haunted ruins! The road leading there is often filled with queuing cars so if you can go by bus, consider doing so because then you can just walk to the entrance. If you happen to be visiting Guayabo on a Friday or a Saturday, don’t miss the chance to shop at the Turrialba Farmer’s Market in the shadow of the Turrialba Volcano. Here you can gain a valuable, cultural experience and be part of a great socializing occasion for the locals. They come here to buy fruits and vegetables as well as locally crafted produce like cheeses, but they also drop by for a visit and to catch up on what’s new in the area. Guayabo National Monument is a great day trip and when you are staying in San Jose or Cartago, you should definitely hit the road and go there. It is located at a short distance from both locations in the district of Santa Teresita and the canton of Turrialba. If you are staying in San Jose, the archaeological treasure is about 65 kilometers away. From Cartago, Guayabo is 40 kilometers away and you can reach it in an hour. The road is paved and has some beautiful scenery for you to enjoy along the way. If you drive back to San Jose through Orosi, you will get a chance to admire the stunning Orosi Valley famous for its organic coffee farms. Are you interested in learning more about Costa Rica’s colorful past? Pay a visit to our Costa Rica history page!